It’s one of my favorite times of year. The volunteer mulberry trees in my yard have begun popping with mulberries, and the kids have come inside from a morning out in the yard with purple mouths and sticky hands. 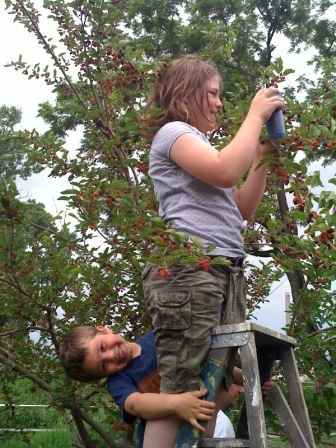 I’ve never been a huge fan of cooking with the berries – we usually just grab some off the tree, wash, and eat. This year, however, I’m determined to supplement my groceries with the tiny dark berries. Here are my favorite ways to put them to good use. Preheat oven to 400 degrees. Cream shortening and sugar together. Add eggs and mix well. Sift 1 ½ cups flour, baking powder, and salt together. Add this mixture to egg and sugar mixture alternately with milk. Sprinkle mulberries with remaining flour and stir lightly. Bake in grease muffin pans for 25 to 30 minutes. 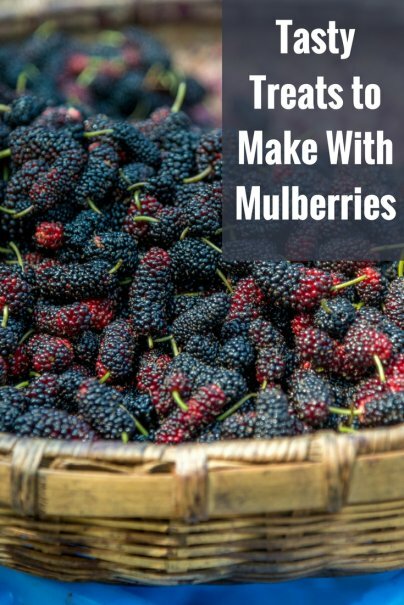 Using damaged mulberries, reduce them to juice in the usual way. Put the juice into a preserving pan with the sugar. Bring to the boil, stirring, and then skim. When moving vigorously, tip in the mulberries. (They should be ripe but not soft enough to mash.) Take the pan from the stove and leave until the fruit is warmed through (taste one). Then put back on the heat and boil gently for about 15 minutes. Pour carefully - so as not to break the fruit - into a large bowl. If, however, you are using a stainless steel preserving pan, you can leave the mulberries in it. Next day, bring to the boil and simmer steadily for 15 minutes, or until setting point is reached. The point of this careful method is to keep the fruit as intact as possible. You can avoid breaking the fruit 'by gentle stirring, and by simmering the fruit very slowly. Put into jars to store. I made BOTH mulberry muffins and mulberry pie this weekend for coworkers, and both are now gone. I didn't remove stems for either with no problem. For me, it's been a great mulberry season! I tried the Mulberry Wine once. There was no need to remove the stems for that. I kind of liked it, it had an interesting mineral sort of flavor, not sweet. My SO hated it, however! These recipes sound incredible Linsey. Going to have to try them. Thanks for sharing. I have the world's largest mullberry tree in my back yard (okay, not like it's exactly been measured but I'm sure it's at least a contender! ), so this post is great - thanks! I especially like the blanket/sheet idea for harvesting the berries. I just made a batch of yummy muffins from the recipe I listed above. It's not a very sweet muffin, so if you like it to be more like a cake/dessert, then add a bit more sugar. If you like it to be more like a bread, however... it's perfect! I added a bit more of the berries, and they are so moist and have a great color. They look a lot like blueberry muffins, but without the tartness! I have so many trees, I don't even know what to do with all the berries. A friend said I could dry them, so I'll try that. Maybe good for adding to pancake mix later in the year? Mulberries are not bland, i am deeply offended on behalf of all mulberries. i think you should reconsider this statement. Maybe something is wrong with your mulberry tree? are you eating them at the right time of ripeness? when you first put a mulberry in your mouth is bland the first thing that comes to your mind? do you even own a mulberry tree?